*The cards pictured in base set do not exist. They are original mock up images. Lincecum, Pujols, Hamilton and Cano are all featured on other card designs. These autographs have a wonderful look to them. Most of the players in the set have great penmanship and the result are incredible looking cards. Some of the autographs are more short print then others. Hank Aaron, Ken Griffey Jr and Willie Mays are just a couple examples of Sp auto’s. Topps typically does not release which auto’s are Sp’d. Jose Oquendo has several different versions – that is why his name is listed several times. 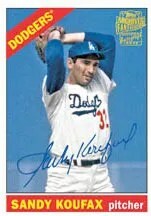 If you like the 3-D cards then give the ones that were in 2011 Topps Lineage a look. You might be able to complete both sets fairly cheap. Come as redemptions – Topps did not initially release checklist information. Very hard to get. Topps Archives returns after being a ‘fan favorite’ several years ago. This set is similar to Topps Heritage in that all the cards are on retro Topps designs. The cool thing about this set is you get a wide variety of cards, especially on the autographs. This set features Ken Griffey Jr. autograph cards, which are actually pretty rare for now, as he used to be an exclusive Upper Deck athlete. Outside the autograph cards, there are plenty of insert cards and parallel cards to collect. There will be retail boxes of this product – but the hobby boxes contain the best mix of cards.